Published By – Harrisongs Ltd. Released in mono on 180-gram vinyl LPs, newly mastered from the analogue master tapes and with replicated artwork. Includes a top opening gatefold cover, black inner sleeves, poster and four colour photos. A unique number is stamped on the front cover. The front sticker has the barcode, tracklisting and mastering information. The back sticker has "Made in Germany". Eric Clapton uncredited on A7 for contractual reasons. When these 2014 mono pressings are truly all gone and cost FAR more than they do now, many will wonder why didn't I grab a copy when it was relatively easy. My belief is these albums will never again be done from the original tapes. This is the last time. Future pressings, if and when will be done from the transfers they did. People complain about the cost for some of these, just wait, 10, 20 years from now. The cost will seem minor compared to then, people haven't truly begun to understand what a treasure these 2014 pressings really are. Some get it, but many, many who don't, will be paying dearly once they finally do. These are now in ky opinion the definitive pressings of these albums. 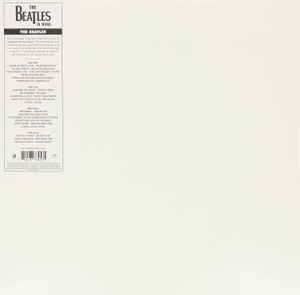 Yes, we can debate whether the tube cut original pressings are better, there is an argument for that, but for me, the originals are certainly great, and another side of the coin, but as far as overall, package and pressing, 2014 Beatles Mono vinyl is and forever more will be king. Really excellent reproduction here, impeccable pressing and a truly authentic representation of this quintessential album. Wow, first off: absolutely dead quiet pressing, never heard a quieter one! Sound wise, this is.... interesting. The feeling is inescapable when hearing this, it seems truly authentic to the original recording (even though I have no way of really knowing), especially being in mono... but what goes with that is inconsistent volume levels and equalization. For instance, some songs sound quiet with low bass, almost sounding like demos ("Ob-La-Di, Ob-La-Da" for example), while most other songs are louder and fatter sounding ("Why Don't We Do It In The Road?" is bombastic, contrasting sharply with the more tepid "Don't Pass Me By" right before it). I'd have to do an A/B comparison with my 1976 pressing, but that'd be like apples vs oranges since that's stereo and this is mono. All that said, I don't regret the purchase one iota-- it's worth having as a different take (especially the intensely alternate raw mix of "Helter Skelter") on this classic among classics. Absolutely beautiful, flat pressing and packaging. Sound quality is outstanding. My records both have slight warping, probably due to the tight packaging and inserts, but they sound totally awesome and are beautifully pressed and dead quiet. It takes a bit of getting used to when you are so familiar with the stereo version, but it's definitely worth having both. I don't understand the negative issues some people are having with the sound or mix? Know I'm late to the show, but, this version is currently blowing my mind. Clear, punchy, genuine mono sound. Stereo is mellow and tamed compared to this mono pressing. This version sounds amazing I don't know what's going on with your versions but mine sounds great! This audiophile edition. what equalizer. This is a poorly made marketing cheap.